Hundreds watch the start of a Penobscot River project viewed as a model for fish and waterway restoration. INDIAN ISLAND – Bill Townsend is an old man, at 84, but he’s steady enough on his feet to walk down a muddy bank of the Penobscot River and watch as excavators smash the defunct concrete fishway of the Great Works Dam. Removal of the dam started with a ceremony led by Butch Phillips of the Penobscot Indian Nation, who did smudging to bring everyone into the same frame of mind. 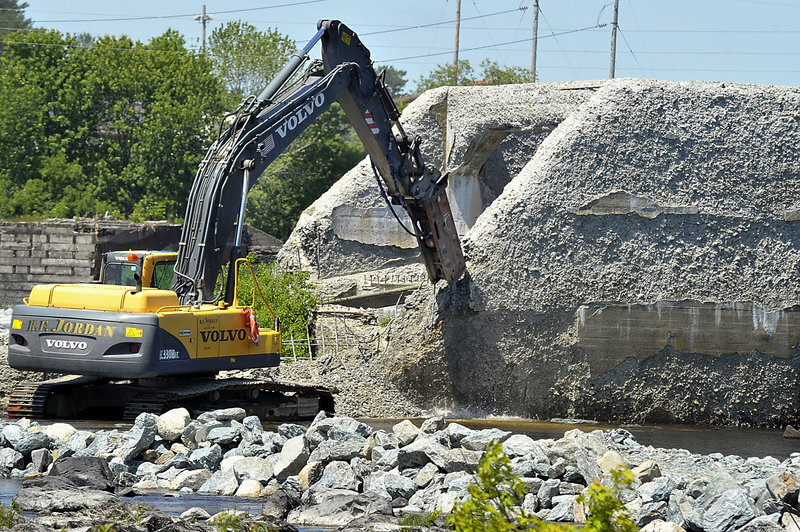 An operator of heavy equipment begins to break up the concrete fishway to start the $62 million Penobscot River project Monday. Secretary of the Interior Ken Salazar makes remarks as the project begins. “It’s really a great day for America and a great example for anyone who believes anything is possible,” he said. Townsend, a leader in salmon habitat protection, was a middle-aged man 26 years ago when he launched a fight against a hydroelectric dam proposed at Basin Mills, just downstream from here. The federal government’s decision more than a decade later to kill that project set in motion an ambitious plan for the river’s revival. 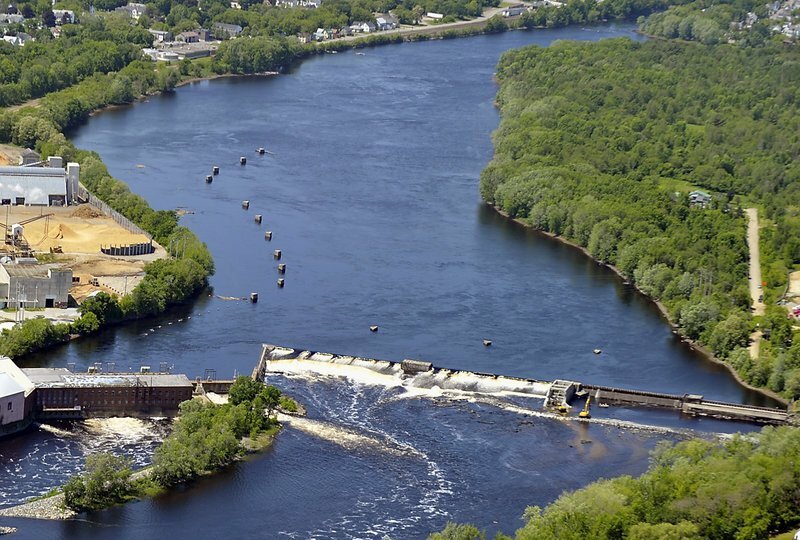 Decades in the making, Monday’s events marked the official start of a $62 million project to remove two dams and improve fish passages at two other dams on the Penobscot. In the end, 1,000 miles of the Penobscot and its tributaries will be accessible to Atlantic salmon and other native sea-run fish for the first time in nearly two centuries. 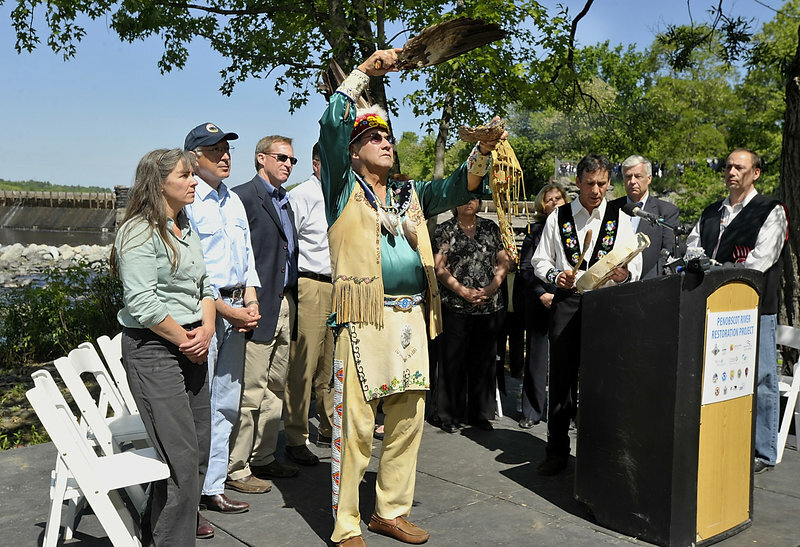 The project is viewed as a model for other restoration efforts in the nation because of its collaboration involving environmentalists, hydropower companies, the federal government, state agencies and the Penobscot Indians. The terms of the multiparty agreement will allow power companies to increase generation elsewhere in the river watershed so there will be no loss of power production. 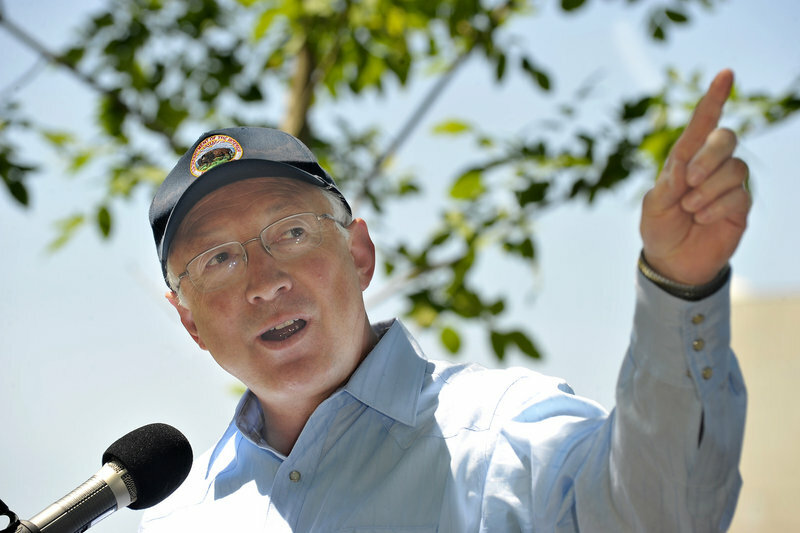 “It’s really a great day for America and a great example for anyone who believes anything is possible,” Ken Salazar, secretary of the U.S. Department of the Interior, said at a news conference Monday on the riverbank in the town of Bradley. Hundreds of people watched the start of the demolition — in person or on video at Sockalexis Hall, the bingo hall on Indian Island. Speakers included Chief Kirk Francis of the Penobscot Indian Nation, U.S. Rep. Mike Michaud and U.S. Rep. Chellie Pingree. Maine Marine Resources Commissioner Pat Keliher announced that 50,000 alewives have been stocked this spring above the dams. The fish will swim downriver to the ocean later this summer. When they return in four or five years, they will find spawning grounds upstream because the restoration project will be complete. The project also will increase populations of other sea-run fish, including shad, and boost fisheries in the Gulf of Maine, Keliher said. 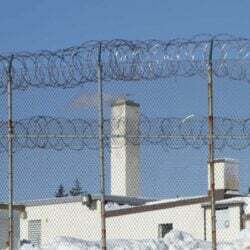 The federal government is funding half of the project’s cost, and private donors and foundations are paying the rest. Eric Schwaab, a top official in the National Oceanic and Atmospheric Administration, announced Monday that his agency will spend an additional $1 million in its current budget on the project. Salazar said he will recommend an additional $2.5 million. The Penobscot Indian Nation played a critical role leading up to the project. The Penobscots’ status as a sovereign Indian tribe gave them leverage during the federal license-renewal process for the hydroelectric dams in the watershed. Collaborating with environmental groups, the tribe argued that the federal government is required to ensure proper management and protection of tribal natural resources, including the right to harvest fish from the waters within its jurisdiction. A deal reached in 2004 gave the dam owners certainty about future federal regulation and allowed them to make investments in other hydro dams in the river basin. The Veazie Dam, scheduled for demolition in 2013 and 2014, is eight miles downstream from Great Works and is the last physical barrier to juvenile salmon reaching Penobscot Bay and the sea. Two dams will get significantly improved fish passages: an elevator to lift fish over the Milford Dam, just downstream from Indian Island, and a fish bypass at the Howland Dam. Butch Phillips, 72, a Penobscot elder, said the river was an “open sewer” when he was growing up on Indian Island. There were no birds of prey, such as bald eagles, and the only fish he could find were eels, pickerel and sunfish. When the dams were built, he said, the Penobscots lost their culture as a river people. The return of sea-run fish will allow that culture to be restored. Before the excavators began their work, Phillips and two other tribe members performed an “honor” dance beside the riverbank and asked the Great Spirit to heal the river.